Seems like November is quite a treat to the Smartphone lovers. 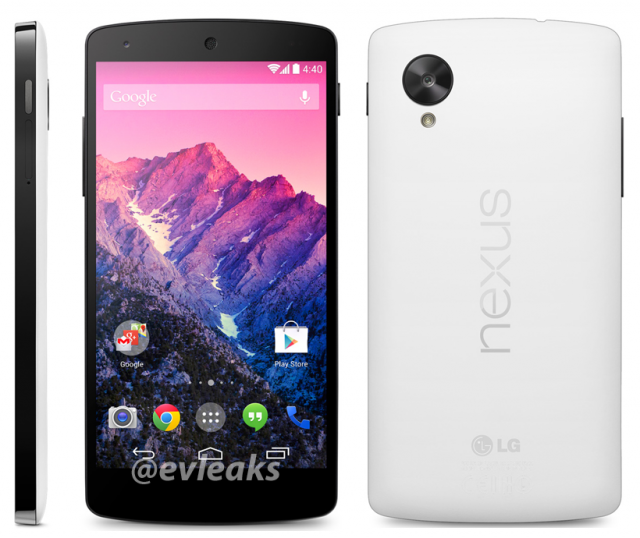 As the purported images of the upcoming Nexus 5 smartphone was already out, but this time a news came up with an add on. The infamous phone tipster, @evleaks has revealed the device in its alleged White color variant. Though it is not sure if the leaked image is an official render, but the device resembles a lot like the device seen in leaks in the past. The leak also speaks of a November 1 launch date. However, it is not officially announced yet. The specifications of the Nexus 5 might include a 4.95-inch full-HD (1080p) IPS LCD display, Qualcomm Snapdragon 800 quad-core processor clocked at 2.3GHz, 2GB of RAM, 8-megapixel rear camera with OIS and a 1.3-megapixel front-facing camera. The smartphone might also include a host of sensors like ambient light, proximity, pressure as well as accelerometer, compass, notification LED and gyroscope.